I land at the new Bangalore airport which is now world-class, slick, big and impressive. It is so far removed from the old Bangalore airport I last visited sixteen months ago where you were jolted into a profound awareness that you were in a foreign country for real: with hordes of people lining the exit ramp and traffic going in six directions at once and a cacophony of horns, calls and mass humanity pressing on all sides. The new airport is much more sedate and orderly and the immersion into the wonderfully varied and exotically, pungent Indian culture is now a little more gradual. I am taken to my overnight lodging where I bump into Toby Smith of Toby’s Estate coffees. As coincidence would have it, he is on the same pilgrimage to attend our friend Nithya’s wedding and to explore Indian coffees including the unique and rare Monsoon Malabar which Nithya imports. Great minds think alike or fools seldom differ; never mind, we are destined to enjoy the ride together regardless. I am interested in this coffee because it is ideal for espresso coffee. Traditionally it was primarily exported to Scandinavian countries but now it has seeped out into the broader specialty coffee world. I am continuing my quest to push the boundaries of the espresso coffee world. What is it that makes Monsoon Malabar world renowned as being suited to espresso? Its cup profile of soft, low acid and smooth, full body is definitely likeable and truly ideal for anyone on an espresso quest. There are about 6,000 tonnes or 96,000 bags of Monsoon Malabar produced annually. This is not a lot in comparison to global output of approximately 120,000,000 bags. The hoary old legend about how Monsoon Malabar began is up there with the often repeated stories about Kaldi the goat-heard and Baba Boudan and his seven seeds coming to India. And since we are in India we hear the Baba Boudan story ad-nauseum. So just in case you haven’t heard it, the story of monsoon coffee goes like this: a sailing ship with its load of green coffee destined for Scandinavia gets held up by a monsoon and by the time the ship arrives at its destination the coffee cargo is no longer green but a pale white color and has swollen up to double its original size and its taste is obviously going to be altered markedly. The Scandinavians thankfully decide like Kaldi and friends, to try it anyway, which is always a very good habit with coffee and they find they like it and they want more. Any acidity that might have been there has gone and it is much softer and fuller in the cup. So this demand inspires some unsung pioneering hero to figure out how to reproduce this process commercially on the Malabar coast. Malabar is one of those mythical coffee names like Mocha. It immediately conjures up exotic and remote images. In the case of Malabar it is perhaps of swaying coconut trees beside a sandy beach with dusky, workers labouring patiently and lovingly over their precious and rare harvest. The reality in the case of ‘Coehlos Gold’ monsoon Malabar is not far from that at all. In fact Mr Coehlos turns out to be a seventy nine year old gentleman who literally processes monsoon Malabar coffee in his backyard while in his coconut tree dotted front yard, the monsoon seas sometimes actually wash in through his front gate. He gets a couple of his workers to cut down some coconuts and insert a straw and we drink fresh delicious coconut milk on the spot. In between his front and back yards he is building a three story magnificent retirement home for himself. But his is a professional approach none the less. For instance, he uses water sprinklers that spurt around his curing sheds to make up for any inconsistency in the moist, humid, salt charged monsoon breeze. He has several large wells on his three acre property and tells me that potable water is readily available only ten feet below the surface of his land. His father was a roof tile manufacturer and his family name is inscribed on each and every roof tile above the precious coffee. His green coffee is spread out a few inches deep in three large open-sided sheds. This is shallower than his competitors. And his workers turn or rake the coffee more often as well: approximately every hour throughout their eight hour working day. The atmosphere is extremely warm and humid, and as it cools at night he tells me, there is no need to rake it then. His coffee is also closer to the Arabian sea than his competitor’s coffee too. I’m not sure, but my bet is that all these little differences make his coffee possibly the ultimate monsoon Malabar coffee. 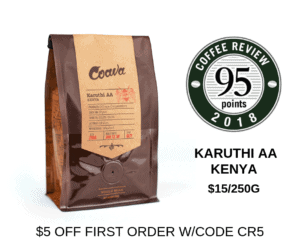 It takes about 2 to 3 weeks for the coffee to absorb its moisture and increase from 11% to 17% moisture content and then another 2 to 3 months of tipping one half full bag into another empty bag several times a day to avoid spoiling, while the moisture content reduces back down to about 13%. This is indeed an amazing labour of love and patience for any producer. Finally this coffee is then shipped to a growing list of discerning customers around the world. I can’t wait, along with my fellow monsoon hunter Toby Smith, to taste the end result in a few months time. Oh and Mr Coehlos has invited us back to stay in his new house when it is completed, where he is happy to expire while sitting on his porch, overlooking the wonderful Arabian sea through swaying coconut trees. This is one of the rare times reality is not far removed from the myth. ARIMIDEX(R). 1. ARIMIDEX(R). Anastrozole. Consumer Medicine Information. What is in this leaflet. This leaflet answers some of the common questions people arimidex generic Get buy arimidex online canada in our Bestsellers Store Online with free shipping overnight. Nextday buy arimidex online canada Shipping.